so what’s in a salad? Fresh-air markets, booths and stalls stretching for blocks and blocks, wooden tables piled high with newly-picked fruits and vegetables. Luscious juice-sweet fruits, all round-body shapes and colors. Rustic root or bright green vegetables some with the earth still clinging to them. Farmers in aprons, their hands, soil-worn and calloused, paring off samples for us to taste. And we held out our hands and we tasted, and we bought what we couldn’t resist. But we’d made some kind of cosmic mistake! We had no kitchen to take our booty to, no salad bowl, no wooden tongs. No aprons of our own. So it happened that everywhere we went, my longing for brilliant color tossed in a bowl grew. We had some nice salads while away, but they weren’t the salads of home. And the salads of home are the foods I miss most of all when we’re away. Thinly slice the shallot and drop it into a small medium-hot skillet to which you’ve added a small amount of oil. Stir occasionally until browned. Remove to a paper towel. Toast the almonds – in a 350° oven for perhaps 15 minutes. Check frequently. (The last bit of browning goes very quickly.) About the last 5 minutes you might (might!) want to place the shallots in the oven along with the almonds to dry and crisp them a bit more. Toss all ingredients into a bowl (reserving a little of the seeds, nuts and shallots for sprinkling on top.) Toss with a little vinaigrette. Taste to see if amply dressed. Drizzle more as desired. Sprinkle bits of brilliance on top. Would you like me to taste it for you and tell you why it’s so good? Even this time of year, most markets will still have fresh crisp baby spinach leaves. These leaves taste mild and green and like Health itself. (Arugula, a little or a lot, but only for those who like the mildly bitter. I do!) Crisp sweet-tart apple, toasted almonds tasting of the hearth, threads of fresh basil winding throughout (these you nearly taste in your nose), crunchy smoky bittersweet bits of shallot, bursting tart seeds full of juice…and then…if you like this sort of thing…mild and creamy, exquisite white cheese of goat. I . love . this . salad ! Shake or whisk all ingredients well. NOTE on Vinegars: If you are so lucky as to have pomegranate balsamic vinegar, oh do use it here! If you haven’t, any good balsamic will work, though you might want to dilute it with just a bit of sherry vinegar or use all sherry vinegar instead. Wow, this is perfect for me! I love all that freshness! Your salad looks beautiful. I, however, hate to eat salads in cold weather — partly because I want warm food to stay warm and partly because I hate having to wash greens in cold water. Yes, please, pretty please. What a perfect salad. Can’t think of one better. And the idea of a slightly crunched oven roasted shallot in there, too…yum! To me, even though it’s cold, it looks like a perfectly inviting fall salad — in flavors and color. And, too, what a good way to celebrate all the bounty of home! Plus, I love your photos! Have I had this before? So many of my favorite things together! This has got to be on the thanksgiving menu. A very good salad and a beautiful picture. It illustrates that restrained, cool daylight that illuminates pictures at this time of year. Thanks Roger. Yes, this low light of near-winter has its own beauty. A beautiful salad for this time of the year. I find that I am using sherry vinegar more and more as the flavor is not as strong or overpowering as some other vinegars. Thank you Karen. I’ll not infrequently cut some of the sweet power of balsamic with the addition of sherry vinegar, but like you, I think it’s often quite great on its own. This looks great and I love the photos! So beautiful, and I love that you brown the shallot! I wish that my kitchen were lined with your photos, are they available for purchase? Emmy – such a nice thing for you to say, such a nice thing for me to hear! 🙂 To know that you’d like to adorn your walls with “food from my kitchen” is the highest sort of compliment to me! I’ve been mulling that thought in my mind…thinking likely it will be an option in the not-too-distant future. All those “funny little details” to work out, you know. 😉 I’ll be sure and make an announcement here though if and when I decide to go forward with that. Again Emmy, thanks so much! Absolutely gorgeous salad!! 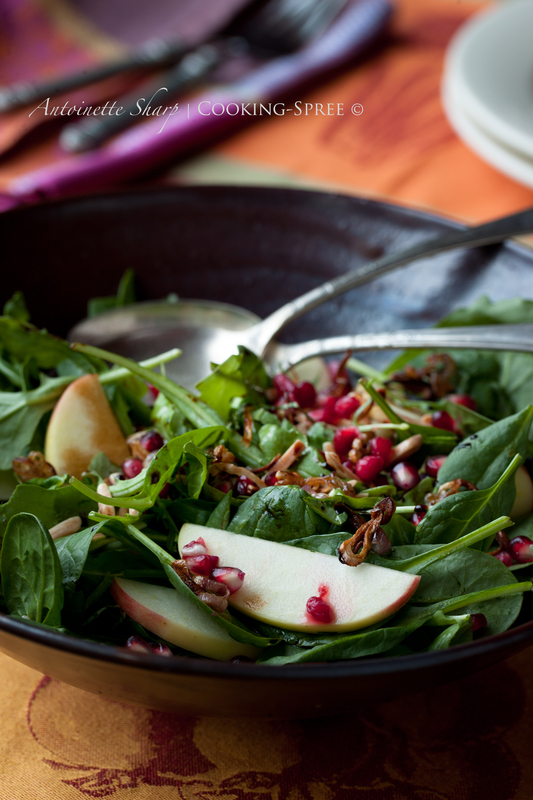 I love the pomegranates and apples and basil and goat cheese and vinaigrette and…What is there not to like about this salad and the photo is sooo beautiful. Perfection on a plate. Such a lovely salad, to look at and, I’m sure, to eat! Art in a bowl. Your photos are always amazing; I really love all the colors that you capture in the food and the textures as well! I always love to find a new interesting salad. This is a perfect winter salad. And I do love your photos too. Thank you for this 🙂 I, too, love salad and look forward to trying yet another beautiful one.